ROCHESTER, N.Y. - Chief Warrant Officer James "Jim" Hall answers questions about the UH-1V Helicopter during the Seventh Annual Rochester Wings event on Saturday June 14. Hall is a pilot with the 249th Medical Company, (Air Ambulance). "Hosting this event is fun and it's a great way to get the word out about the National Guard" said Hall. Attendees were able to view vintage and military aircraft, talk to pilots and crew members and even climb inside the planes and helicopters. Free plane rides were available to children through the Young Eagle Program as well as seminars on a variety of aviation related topics. 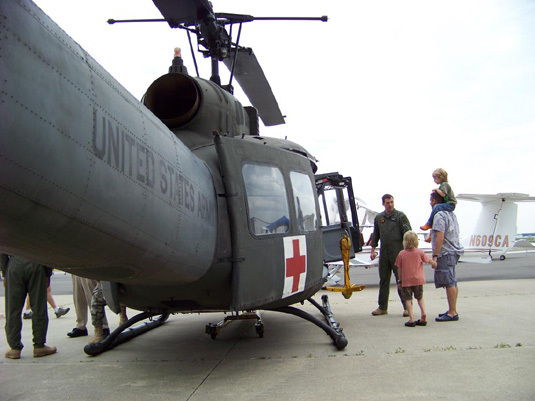 The Army National Guard partnered with Monroe County, the Greater Rochester International Airport, The Federal Aviation Administration (FAA) and the Experimental Aircraft Association (EAA) to sponsor this event.